Expecting big things from the anticipated debuts of new iPhones and a so-called "iWatch" this fall, Evercore Partners on Wednesday increased its price target on shares of Apple to $115 —one of the highest current forecasts on Wall Street. Analyst Rob Cihra sees Apple stock reaching a new all-time high, blowing past its previous record of just over $100 per share post-split. The new price target was announced in a note to investors on Wednesday, a copy of which was provided to AppleInsider. "We see Apple creating its own growth through uniquely innovative hardware+software with integrated services vs. a sea of otherwise commodity devices," Cihra wrote. He sees the company continuing to target massive consumer markets, but in the process focusing on premium markets where margins are highest. Evercore Partners' new $115 price target for AAPL is one of the highest on Wall Street. For this fall, Cihra sees Apple's next-generation iPhone models propelling the company to sales of 58 million units in the December quarter, which would be an increase of 14 percent from the same period a year ago. He believes consumers have pent-up demand for a so-called "iPhone 6" with larger display options. As for the rumored "iWatch," he sees Apple selling 5 million units priced at $249 in the December quarter. Within its first year, he said he "conservatively" sees the anticipated device selling 18 million units. To Cihra, the "iWatch" likely represents a growing theme of continuity between Apple devices. He sees a wrist-worn accessory leveraging the company's ecosystem, making the iOS platform more valuable to both users and developers. He sees technology and services such as Touch ID, HealthKit, HomeKit, Handoff, and iCloud drive helping to further establish Apple in growing markets such as mobile commerce, high-end advertising, and location-based services. 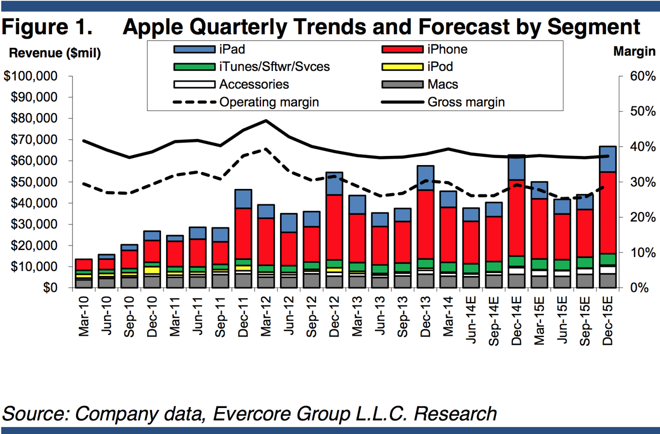 In the nearer term, Cihra sees Apple having shipped 35 million iPhones in the just-concluded June quarter, a number that would represent 12 percent year over year growth. He said that number would put Apple ahead of rival Samsung, which has seen its smartphone sales grow just 6 percent thus far this year. Cihra joins a number of analysts that have increased their price targets for AAPL in recent weeks, ahead of the company's upcoming July 22 June quarter earnings report. Other increases include Needham & Company ($97), Cowen & Company ($102), RBC Capital Markets ($100), and J.P. Morgan ($108).